AmericaPANIC: Picking Up the Pieces After the Republicans Wrecked America: John McCain, having no idea what got us into this mess (i.e. his own party), said in March 2008 that he was in favor of less regulation. Really. John McCain, having no idea what got us into this mess (i.e. his own party), said in March 2008 that he was in favor of less regulation. Really. John McCain is either an idiot, or a he has been corrupted by the lobbyists running his campaign (and writing his speeches). The fact that there was NO regulation of the out of control REIC, no regulation of the out of control investment banks, no oversight of Fannie and Freddie, no oversight of the gambling banks - IS WHAT GOT US INTO THIS F*CKING MESS. Seriously, how much more obvious can it be? So McCain's solution? Even less regulation, even less accounting oversight, even less government involvement. It's too bad that the vast majority of Americans are too financially illiterate to understand this kind of stuff. Because it's pretty fricking important. "In financial institutions, there is no substitute for adequate capital to serve as a buffer against losses. Our financial market approach should include encouraging increased capital in financial institutions by removing regulatory, accounting and tax impediments to raising capital." McCains youtube problem just became a nightmare. over 5 million hits and counting. Barack should just use this over and over again in commercials. Isn't it funny America...Land of slavery.Murder because of race. Many years later we have an opportunity of a life time to have a great Leader who is.....half white and Black. A man who will lead us and bring back the country that once led the world. Senility or early Alzheimers setting in. 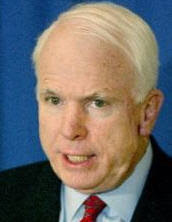 McCain: "Pay no attention to those neoCONs pulling my strings from behind the GOP flag-covered curtain!! I am a MAVERICK!! I am a REFORMER!!" he is right. it was regulation that created the GSEs. regulation also created the fed.